With his brothers, Infante John participated in the conquest of Ceuta (1415) and was knighted by his father in the aftermath. He was invested as the 1st Lord of Reguengos de Monsaraz, Colares and Belas shortly after. In October 1418, at the king's request, Pope Martin V approved the appointment of Infante John as the 10th Master of the Order of St. James of the Sword, bringing the old military order into the hands of the royal family. That same year (1418), John and his brother Henry the Navigator led a relief fleet to Ceuta and helped lift the Siege of Ceuta. After the death of Nuno Álvares Pereira in 1431, Infante John was appointed the 3rd Constable of Portugal. As a result, John is frequently characterised by the appellation O Infante Condestável ("The Constable Prince"). de Monsaraz, Belas and Colares. After King John I's death in 1433, John's eldest brother ascended the throne as king Edward of Portugal. In 1437, Infante John joined another brother Peter, Duke of Coimbra, in arguing against a projected Portuguese expedition to seize Tangier that led to the Battle of Tangier. The campaign ended in disaster. After the Tangier fiasco, John urged the ratification of a treaty with Marinid Morocco that called for the relinquishment of Ceuta in exchange for his captive brother Ferdinand the Holy Prince. The Cortes refused, and Ferdinand was left to die in captivity. King Edward died in September 1438, leaving a young son to ascend the throne as king Afonso V of Portugal under the regency of his widow Eleanor of Aragon. This was an unpopular arrangement among the common people of the country, who feared Eleanor would be a puppet of the high nobility who sought to recover the political privileges they lost during the revolution of the 1380s. The prospect of civil war raised its head. To forestall a rebellion, Infante John quickly seized control of Lisbon and oversaw the assembly of a burgher-packed Cortes to elect his brother Peter of Coimbra as regent for his nephew Afonso V. The high nobility, led by his half-brother Afonso of Barcelos, urged Eleanor to hold fast, and a tense power-sharing regency arrangement was agreed upon between Peter and Eleanor. Peter of Coimbra relied on his close alliance with Infante John to secure the lion's share of power during the first few years of the regency. Infante John's sudden death in October 1442 was a terrible blow to Peter, who thereafter found it increasingly difficult to fend off the aspirations of his half-brother Afonso of Barcelos. Regent Peter appointed John's son Diogo of Portugal to succeed his father as Master of the Order of Santiago and Constable of Portugal. 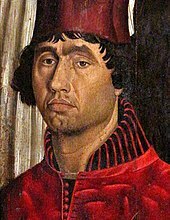 Infante Diogo of Portugal (1425–1443) – 4th Constable of Portugal and 11th Master of the Order of St. James; without issue. Infanta Isabella of Portugal (1428–1496), married John II of Castile, mother of Isabella I of Spain. Infanta Beatrice of Portugal (1430–1506), married Infante Ferdinand, Duke of Viseu, mother of Manuel I of Portugal. Infanta Phillipa of Portugal (1432–1444), Lady of Almada.